If I had one free wish it would be that my family would grow up in a safe, loving world with good friends and close relationships with their family and Heavenly Father. OK! another chance! I didn't get it last time! I'll come back when I have more time to enter! Thanks for having another one! Thanks for the wonderful review, Susie! 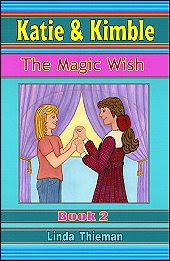 I'm so glad your daughter liked Katie & Kimble: The Magic Wish, too! I already got my wish. Meeting you through Twitter has been nothing but fun. The other night while you were tweeting, I was laughing so hard. You have such a great sense of humor! I learned you can make a sweater from the hair of a sheepdog. If I had one free wish it would be that my kids had a great life. I follow the Scraps of Life blog. #5 I entered the Febreze Giveaway. #4 I entered the Febreze Giveaway. #3 I entered the Febreze Giveaway. #2 I entered the Febreze Giveaway. I joined your Scrap of Life Blog! I like the Kimble Kimble Chant on the site! I entered your Febreeze giveaway. My one free wish would be that I could lead the perfect life and always be on top of everything. I really like the Kimble Kimble Chant. I'm entering the Febreeze Giveaway! I favorited your blog on Technorati! Thanks! If I had one free wish, I would go to Africa and educate children there. Thanks for asking, no one ever asked me this before! If I had one free wish it would be to be a nurse. Entry: If I had one free wish it would be that everyone could have what they wished for. As long as I have my family and friends, I don't need wishes. I learned the Katie & Kimble chant. 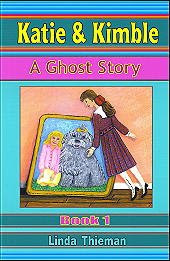 Kimble, Kimble is a ghost. Katie, Katie loves her most. Found a bow inside a log. Kimble, Kimble put it there. Katie wore it in her hair. I learned that you can purchase and instantly download her books. If I had one free wish, i would wish that we could always follow our hearts and not be restricted by financial problems. If I had one free wish it would be for unlimited wishes. I learned that the Katie & Kimble blog recently received an award called the Premio Dardos Award. For my children to grow up where there is still freedom. Comment #43 via Random.org which was Anna won! Thanks all for playing! Please don't forget to check out KatieandKimbleblog.com to still get a copy of the book! Very worth your money and support! I love the make a wish! How sweet. I've entered the new contest.